I happened to be idly browsing the net when I was drawn to the Perry Miniatures website - and look what I found! Coming next month is a Portable Wargame on a grid and based on an idea from some 25 years ago. Needless to say I am very interested in this and I reckon that several other gamers of my acquaintance will be as well. 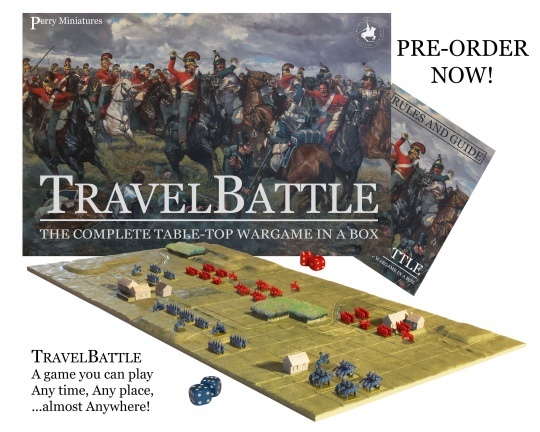 TravelBattle is a complete table top miniatures game in a box. It is intended for gamers who have limited space, or those who are traveling on a long journey or holiday and need a gaming fix! All the playing pieces are made of coloured plastic, and include two 3 dimensional green terrain boards with separate woods, grey buildings and red and blue armies. The size of the miniatures is 8mm. The two terrain boards are designed to be placed together on any edge, giving the potential for 16 different battlefields. The 1" grid marked on the boards excludes the need for rulers to be used in the game. The simple rules system should allow a game to played within an hour. The two armies are generic Napoleonic forces of equal size and composition which make up three brigades for each side. There is a simple painting guide in case you which to enhance your armies and terrain boards. I can hardly wait to see this and hope that it spawns a whole world of other 'stuff' along similar lines. I am already thinking about my 3mm project using the terrain boards - the 1" base sizes I am using would work ideally with this. I saw this a couple of days ago mentioned in one of my facebook groups. I admit the thing is very tempting, though the 50-quid price tag does give one pause. The game board comprises 2 pieces each 10x10 1-inch squares, so the thing is certainly compact. The design of the boards is such as to offer 16 different battlefields. Does sound a fun game to try out.